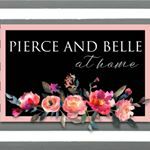 Pierce and Belle has been an Etsy shop since 2016, we make custom baby bodysuits and have expanded to t-shirts for everyone, totes, towels and other small gift items. In conjunction with etsy we do have a few locations in Spring at an Antique mall where we sell curated antiques as well new accessories. Our main online focus right now are the shirts/totes/towels that we sell on our current Etsy platform.